The use of Bowdoin College PolarPrint printers for OS X requires the installation of one package which is described in the following steps. Pleae Note: Pharos does not support Fast User Switching. Fast User Switching must be disabled on the Accounts pane in System Preferences before any Pharos software is installed. You may select as many printers as you'd like by clicking the Install button next to each one. When ready, click on the Updates icon across the top of the window. After a few moments of checking for other updates, the Cancel button will become an Update All button. Click that button and the printers you selected, along with any other required updates, will be downloaded and installed. 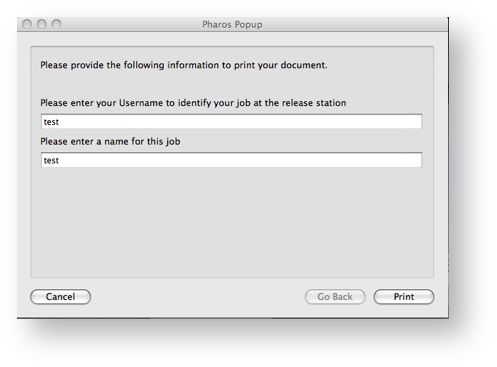 When you send a print job to a public printer the Pharos popup window will appear. You must type in your Bowdoin username and a name for your print job. This is how you will identify your print job when you got to the Print release station next to the Public Printer. You must enter your Bowdoin username on the top line of the popup window. If you do not enter your Bowdoin username, you will not see your print jobs when you swipe your OneCard at a PolarPrint release station. Check out this knowledge base article I found in the Bowdoin College knowledge base. https://bowdoin.teamdynamix.com/TDClient/KB/ArticleDet?ID=22414 Install PolarPrint Printers for OS X Directions on installing PolarPrint Printers for MacOS.